Entertaining, well acted thriller drama of sorts with an occasionally silly, over the top plot that is nonetheless engaging throughout, so long as you keep your disbelief in check. The movie isn’t the most well written, and often comes just short of being something quite special, mostly due to an unnecessary plot twist of sorts that marks the end of the first act. 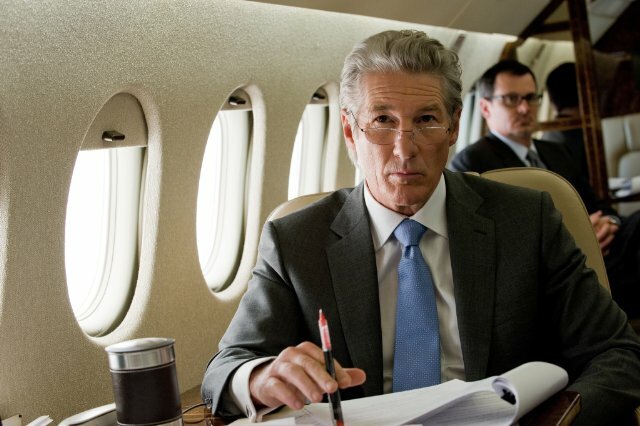 How Richard Gere’s character **SPOILERS** manages to survive such a thing with no medical attention whatsoever, probable internal bleeding/broken bones/head trauma and all, **END SPOILERS** is beyond me. And, again, the plot had enough going on already without the need to add that element to it as well. It’s a bit of an overkill. Crazy plot twists aside, the film is pretty well acted for the most part. Gere is charming and likable despite his character’s many poor, borderline sociopathic decisions, and he does a good job with the more dramatic stuff too, especially in a monologue he gives near the middle. You can tell he’s been doing this acting thing a long time, and at this point has it pretty much down pat. Everyone else is okay, even Brit Marling who actually displays emotions here sort of, unlike that terrible double Earth science fiction movie she was in. And man is she pretty. Susan Sarandon, though, isn’t all that great. She feels miscast, especially during some later scenes where she’s alone with Gere. And Tim Roth, god. Not sure what the hell he was doing here. Terrible. Overall, I enjoyed the film. It’s fun and thrilling and yes, ridiculous at times, but whatever. It’s a B-picture of sorts that probably could have turned out to be something quite great had it taken itself more seriously, or trusted that its initial premise could sustain the entire picture rather than just the first half hour. So, watch, yes. It’s somewhat stupid at times, but very enjoyable.